Imagine a world where humans can travel faster than the speed of sound. Aviation technology is advancing to a point where that could soon be a reality. A Denver-based startup announced during the Paris Airshow in June that its new supersonic jet might be able to break the sound barrier. The company, Boom Technology, says its goal is to have Boom Jets carrying passengers from Paris to New York in three and a half hours by 2023, cutting flight time by five hours. But before these jets can take flight, Boom Technology is going to need access to a lot of minerals. 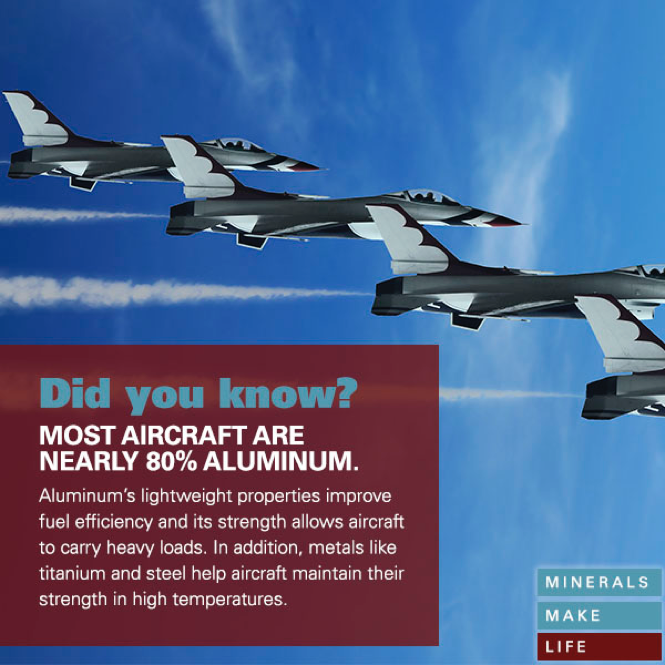 Beryllium and aluminum are used to construct jets because their lightweight properties help aircraft quickly reach high speeds, improve fuel efficiency and carry heavy loads. To create aircraft parts that power jets, molybdenum is often used because of its super-strength and ability to withstand corrosion. Titanium is a unique mineral because it has the strength of steel while weighing significantly less. Its durability is also important because it maintains its strength at incredibly high temperatures. And minerals aren’t just in high demand for the commercial transportation industry. The Department of Defense alone uses more than 750,000 tons of minerals annually to create the technologies that keep our troops safe—including fighter jets and helicopters. These jets contain minerals like nickel because of its ability to withstand impact and copper for its corrosion resistance. Whether it is getting people to their destinations faster or developing life-saving military equipment, minerals play an important part in these evolving aviation technologies. Despite its wealth of minerals, the U.S. imports more than one-half of its nonfuel minerals and is 100 percent import reliant on 20 key minerals. The outdated and duplicative mine permitting process creates delays that can last up to 10 years. These delays make it nearly impossible to secure domestic minerals in a timely and efficient manner, hampering our industries’ ability to innovate and grow. It’s time we unlock our nation’s minerals potential! Learn more about how minerals drive America forward and transform technology here.